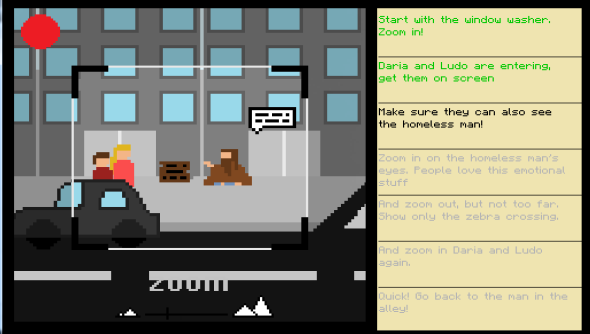 One Take deservedly won the most recent Ludum Dare contest. Putting you behind the camera on a film set you were tasked with following the shooting script and making sure the right actors were in frame at all times. Mess up and your film would be panned by the critics. Daniël Haazen, One Take’s creator, has decided to expand the game into a full release for the PC. The short Ludum Dare entry sees you shooting three films. A western, a horror, and a thriller. Really you’re only shooting a single scene in each so if the game is expanded into a full game we’d hopefully see more of the film’s being made. It’d also be good to see the metagame expanded. At the end of the game you’re given a score based on how successfully you followed the director’s instructions. If you do well then you’re recognised by the academy. This would be a ripe area for development. Successful films could earn you more money to improve your camera and awards could unlock work at bigger movie studios. All sorts of things. You can play One Take over on the Ludum Dare site. Puts me in mind of Ian McKellan explaining his process.